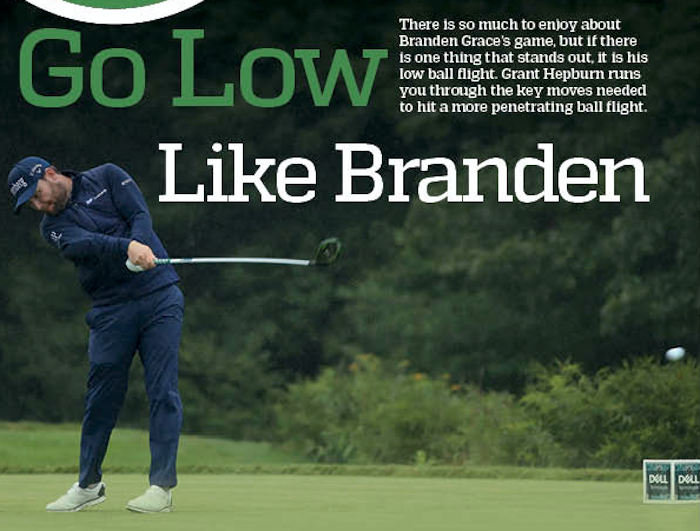 There is so much to enjoy about Branden Grace’s game, but if there is one thing that stands out, it is his low ball flight. 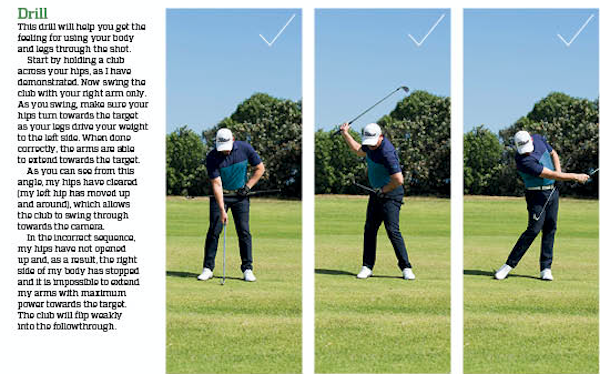 GRANT HEPBURN runs you through the key moves needed to hit a more penetrating ball flight. Grace ranks last on the PGA Tour when it comes to the apex height off his drives, meaning he hits the ball lower than anyone else on Tour – with a gentle fade that he is able to control exceptionally well. This penetrating ball flight is especially well suited to links golf and it is no surprise that Grace’s record for the lowest round in a Major (62) came at Royal Birkdale in 2017. He was able to keep the ball under the wind and get the most roll out of the firm links fairways. If you are someone who struggles to keep the ball down, I will explain how to hit the ball lower, by stealing some of Grace’s secrets. In order to keep the ball down, there are a couple of important things to notice in my swing with a mid-iron. As I approach the ball, I’m transferring my weight towards the target, with my legs and weight moving on to my left side. What’s important is that my hands have reached a position in line with the ball, while the wrists are still cocked. This means they are leading the clubhead into the ball, which allows me to trap the ball at impact with the shaft leaning slightly forward. This delofts the clubface slightly and squeezes the ball out with a low, penetrating flight. This is something Grace does brilliantly in his golf swing. What’s also important is that my legs and body keep moving as the arms swing through the shot. This ensures I maintain control of the club and my arms through impact and into the followthrough. 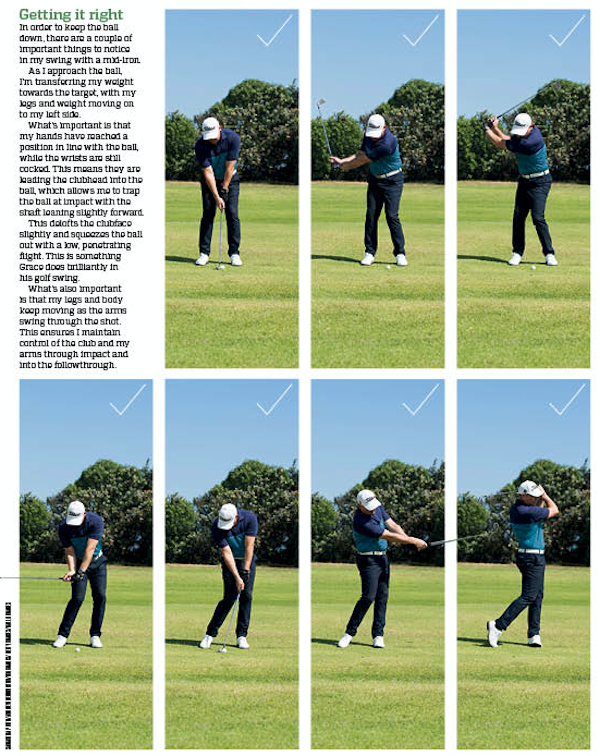 A common mistake among amateurs is that they try to scoop the ball into the air, but by doing so, they allow the clubhead to overtake the hands at impact. The clubhead has swung past the hands, which adds loft to the face of the club and height to the trajectory of the ball. 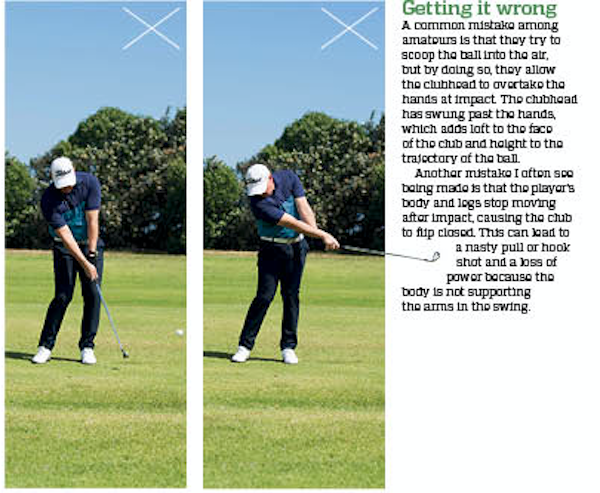 Another mistake I often see being made is that the player’s body and legs stop moving after impact, causing the club to flip closed. This can lead to a nasty pull or hook shot and a loss of power because the body is not supporting the arms in the swing. If you are someone who struggles to get your hands to lead the club into the ball, practise hitting some shots with the ball well back in your stance. This exaggerated position of the ball being back in your stance will force you to lead with the hands and you will learn the feeling of hitting with your hands in front of the ball, resulting in the lower ball flight you are seeking. This drill will help you get the feeling for using your body and legs through the shot. Start by holding a club across your hips, as I have demonstrated. Now swing the club with your right arm only. 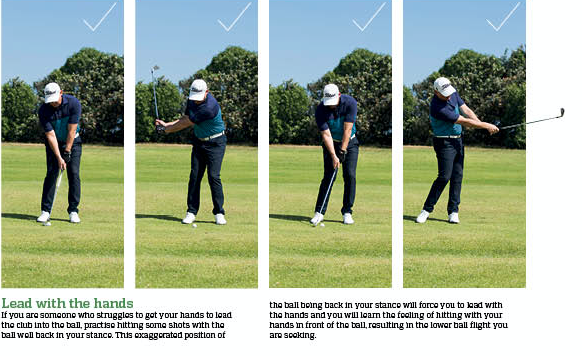 As you swing, make sure your hips turn towards the target as your legs drive your weight to the left side. When done correctly, the arms are able to extend towards the target. As you can see from this angle, my hips have cleared (my left hip has moved up and around), which allows the club to swing through towards the camera. In the incorrect sequence, my hips have not opened up and, as a result, the right side of my body has stopped and it is impossible to extend my arms with maximum power towards the target. The club will flip weakly into the followthrough.